For many years I have been specialising and sourcing fine antique jewellery, which includes antique Georgian jewellery, antique Victorian jewellery, antique Edwardian jewellery, Art Deco jewellery and antique Art Nouveau jewellery. I have been collecting and trading in fine antique jewellery for over 18 years, participating and attending antique jewellery fairs, lectures and seminars. My involvement and achievements within the Antique Jewellery Trade continue to excite me, particularly with regard to my involvement with the BBC programme BBC Antiques Master presented by Eric Knowles and Sandy Toksvig. It was a huge honour to receive a letter from the BBC confirming my status as an Official Supplier of Antique Jewellery to the BBC. Further achievements have been, my acceptance into the prestigious body of the NAG, National Association of Goldsmiths, where I embarked on their Jewellery Education Training programme, and passed with flying colours. And of course, for me, my enthusiasm still abounds, whilst attending Antique Fairs around the country, and meeting so many people with an equal passion for fine antique jewellery, and being able to assist them in their important antique jewellery purchase, or sourcing an item of their dreams, whether it be a special antique diamond engagement ring, antique earrings, antique diamond rings, antique pendants, antique brooches, antique bracelets, antique necklaces or any other unique item of antique jewellery. 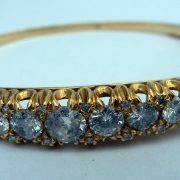 Alongside purchasing an item of antique jewellery, there is a place for collectors to indulge themselves by also investing in fine items of pre owned designer jewellery, such as Cartier, Tiffany, Bulgari, Kutchinsky, Chopard, Guilliano, Van Cleef and Arpels, to name but a few, as these items, with provenance, should prove to be a valuable item of antique jewellery for future generations to enjoy. 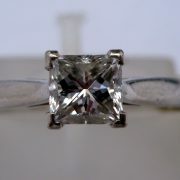 I have a large range of antique diamond jewellery, antique rings, antique bracelets, antique necklaces, antique brooches, antique Art Deco jewellery, antique Edwardian jewellery> and more rarely antique Georgian jewellery, which is regularly updated on this site. 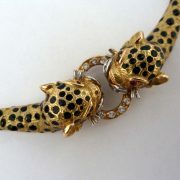 I regularly attend antique jewellery fairs in London, the South of England and various other locations in the UK. Please contact me for a fast reliable service, and be assured, complete care will be taken with your personal items of antique jewellery. I am also happy to restore, adapt, or redesign an item of antique jewellery, and replace lost antique gem stones, or diamonds from my supply. 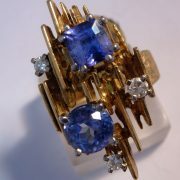 I also welcome the opportunity to purchase items of antique jewellery, or indeed pre owned designer jewellery, in any condition, please feel free to contact me. For viewers of The Only Way is Essex, jewellery features heavily in the programme. You could find your own personal piece of Essex Jewellery for a bargain price on my site, as most of us Essex girls like a good deal, so hopefully The Only Way is Essex has inspired you to invest in some beautiful bling Essex Jewellery at bargain prices.